Beginning July 13 and continuing for the next three weeks, we will release one or two items on our list per day, beginning with No. 25 and working our way up to story No. 1. Today, we announce No. 8. Two teams who have dominated 4A and 5A football in the state of Utah in recent years were once again holding trophies when the curtain closed on the 2014 campaign at Rice-Eccles Stadium. The efficiency and effectiveness with which Timpview and Bingham repeated as state champions combines as story No. 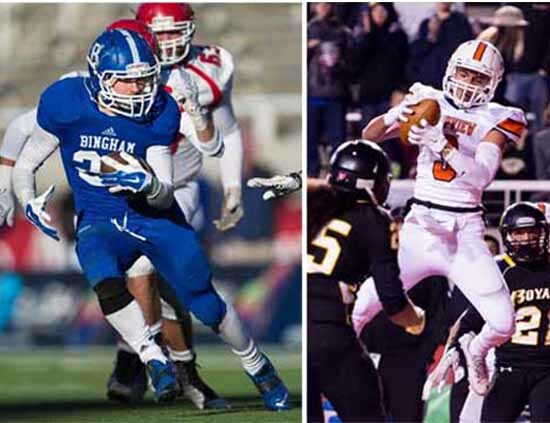 8 on our Preps Utah 2014-2015 Top 25 story countdown. It wasn’t supposed to go this way. 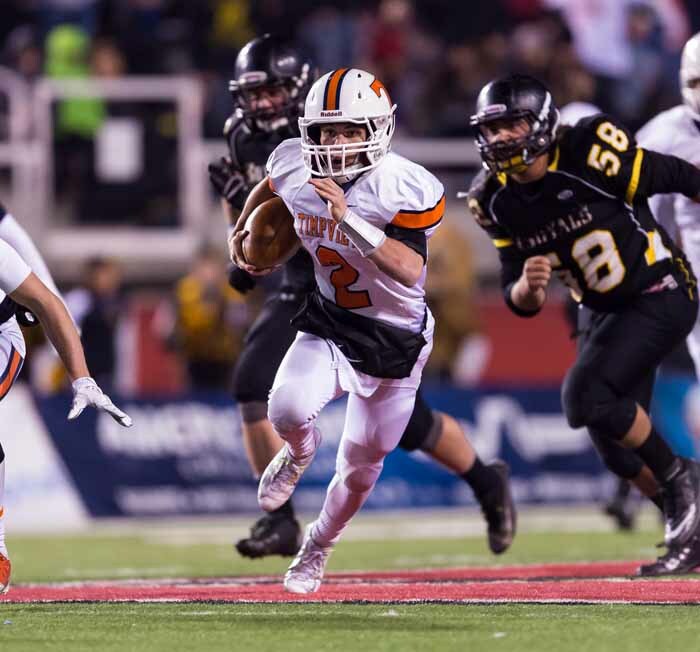 After dominating its way through a 10-0 regular season and seemingly on its way to a third consecutive Class 4A state football championship, Timpview was in trouble. Hosting an opening round playoff game in its home stadium against an East team that had just managed to sneak into the postseason as the fourth-place team from Region 6, the Thunderbirds were being dominated at the line of scrimmage. East was in a little bit of a rebuilding mode in 2014, but the Leopards were fired up for the challenge against a team that had eliminated them from the last two state tournaments. East started this first-round battle with the ball and pounded away with its ground game, chewing up clock before coming up empty. The Leopards intercepted Timpview quarterback Britain Covey twice before intermission, after they scored the game’s first touchdown, backed up by a fortuitous two-point conversion, to take an 8-0 lead. It was an advantage that held up until Covey used a 30-yard scramble followed by a four-yard touchdown pass to level the game at 8-8 with just seven seconds left in the half. Isaiah Holloway took the second-half kickoff 95 yards to the house to put the T-Birds on top 15-8 and the Timpview defense kept East from adding to its total for an eventual 18-8 win that showed the kind of game the Thunderbirds had to be ready to play if they hoped for another state title. Timpview rolled through the quarterfinals and semifinals to reach the state championship round, where a battle with similarly unbeaten Roy awaited. It was a championship game that caused the T-Birds to call on everything they learned about themselves during that East contest. The Royals deployed every defensive stratagem they could devise to bottle up Covey, and it worked during the opening half. The electric quarterback ran for just 14 yards before the break and Roy took a 7-0 halftime lead. It was an unfamiliar position for the Thunderbirds, who had been held scoreless in the first half since 2007. Covey opened the third quarter with a newfound confidence. He completed 4-of-4 passes on the opening series, finishing it off with a 12-yard scoring strike to Jordan Espinoza that got Timpview on the board and tied the game at 7-7. Always dominant, and really the story of the season and this game for Timpview, was the Thunderbird defense, which stepped up again when needed in the second half. A big stop on Roy’s first chance of the third set up the Timpview special teams for a game-changing play. Will Watanabe dropped back to catch a punt and nearly fell down before collecting himself and carving a path through potential Royal tacklers for a 70-yard TD run. The momentum had swung, and with the defense keeping Roy on its own half of the field, Covey ran Timpview down to the 9-yard-line on carries of 19 and 28 yards before hitting Samson Nacua with the scoring toss that essentially iced the game. The Thunderbird quarterback turned those 14 first-half yards into 141 for the game and after adding one more scoring pass for good measure, led his team to a 28-7 win and a third consecutive state title. 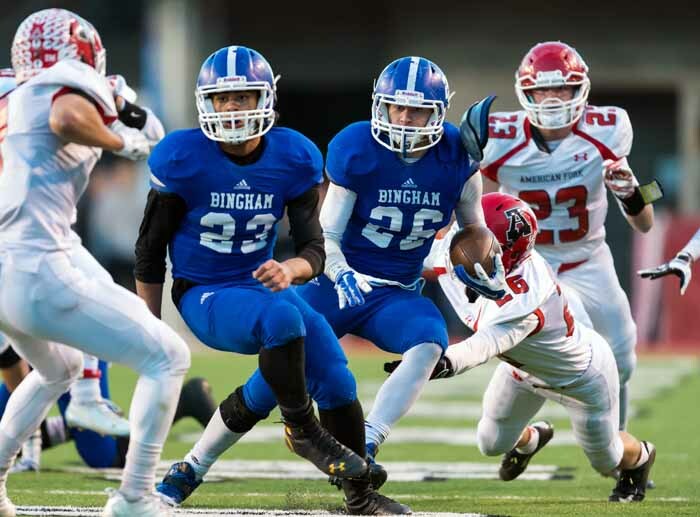 While it had few opportunities during the season to show its ability to win close games, Bingham had the answers when pressed by a very talented American Fork team in the 5A state finale. Perhaps it was falling short in an early-season trip to nationally ranked Bishop Gorman in Las Vegas that prepared the Miners for the championship battle, or maybe it was just the fact that this is a team that has been here before, but whatever it was, when the Cavemen issued a challenge, Bingham responded. In its 2013 state title matchup with Brighton, Bingham won after losing quarterback Kyle Gearig to a concussion on the final play of the first half. In 2014, Gearig was injured in the semifinal round, when backup signal caller Ben Boelter stepped in to make some big throws. Playing without their No. 1 passer in the championship game, the Miners turned to their defense, and to running back Cameron Smith, with just enough Boelter and some trickery to boot, to hold off American Fork. In the end, it was the signature Dave Peck defense that made the big plays to hold a Caveman offense that had scored 42, 58 and 58 points in its three postseason wins to just three points. The first big play by the Bingham defense came courtesy junior defensive back Simote Lokotui just before intermission. The Miners had built a 10-0 lead, but American Fork drove deep into Bingham territory looking for much-needed points before the break. The march ended when Lokotui knocked the ball free from tight end Nate Heaps as he was fighting for extra yards. The ball bounced out of bounds in the end zone and turned over to Bingham at the 20-yard-line. The Miners scored on a Smith run to increase the advantage to 17-0 midway through the third quarter and later, leading 17-3, Peck went to the bag of tricks to extend a Bingham drive and set up the field goal that extended the score to 20-3, which held to the end of the game. It came on fourth-and-8 at the American Fork 38, and the Miners went into punt formation. Instead of kicking away, they snapped the ball to the up-back in punt formation, Michael Green, and he connected with Kade Cloward for 21 yards and a first down. Every time Bingham needed a play, it made a play. Because of that, the Miners finished another season as the top team in Class 5A. The result got them an invite to Florida to play in the State Champions Bowl Series in late December against another nationally ranked opponent. Bingham took another powerhouse team, Booker T. Washington, to overtime, but feel short once again. Booker T. Washington scored late to tie the game at 28-28 and then sacked Gearig to end the Miners’ overtime possession before scoring the game winner to knock off Bingham 34-28.